These Terms and Conditions and any questions, disputes or other matters relating to them will be governed by and determined in accordance with the laws of England. In these Terms and Conditions “the Company” refers to Access Displays Limited and The Design Shop (Swindon) Limited, “the Customer” and “the Hirer” refer to the party who requests the supply of goods and/or services from the Company. Please note that by the term payment we mean cleared funds in our bank account. Unfortunately we are unable to accept your banks transfer documentation as proof of payment. It is your responsibility to make any transfer or payment in good time in order that your products or project are not delayed or cancelled. All customers are required to pay 100% of the invoiced value for products and services before production commences or installation/despatch takes place, unless stated otherwise. We accept payments by posting a company cheque or transfer by BACS, CHAPS, Credit or Debit Card. Credit Card payment attracts no fee. We support payment in Pounds sterling only unless agreement has been made by prior consent. Please note: if bank charges are deducted from our invoice, a £25.00 + VAT surcharge will apply in addition to our original invoice value. Custom build stands are strictly subject to 50% payment with order prior to any work commencing, and the remaining 50% is payable immediately on completion of work. If you are part of a government or educational organisation such as a school, college, university or council we are able to offer 30 day accounts. Please call us on 01793 613088 for more information. 30 day accounts may be opened for regular customers by special arrangement. Please call 01793 613088 for assistance. Approved credit accounts are subject to settlement in full within the pre agreed time scale as set out on the invoice. The company reserves the right to charge interest at 2% above the bank of England base rate on amounts not paid on the due dates. Custom build stands are strictly subject to 65% payment with order prior to any work commencing, 25% payable one week before the show and the remaining 10% is payable immediately on completion. In the event of a clients exhibition taking place within 30 days, the initial deposit reverts to 90% with order. Please ensure your accounts department no not ignore our invoices. Failure to receive cleared payment can cause delays to your delivery or project. Withholding of a project, products or service caused by failure to receive payment. Please note that we reserve the right to withhold the installation or delivery of a project, products or services if we do not receive your payment as cleared funds before the ‘jobs deadline’ for delivery or installation. The term ‘jobs deadline’ means the latest opportunity we have for executing delivery or commencing travel to an installation venue or delivery of products or services. In these circumstances our invoice stands and we accept no liability for any losses, financial or otherwise, that you may suffer caused by the withholding of the project. Products or services. Please refer any questions you may have to your sales contact or our accounts department. For guaranteed time deliveries there will be a nominal charge. By taking delivery of the product the customer shall be deemed to have examined the product and to have found it in good order and condition and reasonably fit for its purpose. Should the product be received damaged or in an un-satisfactory condition, notification to the Company must be made within 24 hours of delivery. Any loss or damage not notified within the stipulated time period will be paid for in full by the customer. Any package delivered in a damaged condition MUST be recorded on the carriers delivery note and the company informed immediately. If the company agrees a specific delivery date with the customer, the customer must take delivery as agreed. Failure to take delivery will result in any storage and/or re-delivery charges incurred by the company being recharged to the customer in full. Failure to take delivery does not result in cancellation of an order. Under the United Kingdom’s Distance Selling Regulations, the consumer (an individual for personal use and not a business) has the right to cancel the contract for the purchase of any standard product, not made to order, within seven working days of receipt of goods or the start of the contract (whichever is the longer). The consumer must inspect the condition of the goods immediately upon receipt and report in writing within 48 hours from such inspection to Access Displays Ltd, this should detail (and photographic evidence be provided where necessary) any damage or discrepancies of goods. Most of our products are covered by a manufacturer’s warranty, however this is void should any modifications or repairs be carried out by the Customer without prior approval. If any goods are damaged upon receipt we will endeavour to replace or repair them as quickly as possible if you let us know within 24hours of receipt. In some situations we will loan equivalent products for the duration of your show but this is subject to suitable products being available at that time. Where possible immediate feedback should be given to your sales representative. If the buyer fails to give such notes, the condition of the said goods shall be deemed to be in all respects in accordance with the contract and the Buyer shall be bound to accept and pay for the same accordingly. Orders can only be cancelled prior to despatch, once goods have left Access Displays Ltd.
Handling, re-packaging, replacement of damaged components, re-stocking and all transport charges will be chargeable. Under no circumstances we will accept returns that do not have their original packaging. Non-standard products that are being specifically designed or manufactured to your specification are not returnable, this includes items which are non-stock colours. Please contact the sales team for more details and to find out whether the product you are interested in is made to order. Upon receipt of returned goods and subject to inspection, payment to the value of the goods as per our invoice will be refunded. Access Displays Ltd makes strenuous efforts to deliver best quality products and results on time every time. However we ask you to note that the company does not accept liability for costs incurred due to delay or failure of its product unless agreed in writing. In all circumstances the company’s liability is limited to that of the value of the product on the company’s sales invoice. Hired equipment remains the responsibility of the hirer between the dates agreed or until returned to Access Displays Ltd, and must be insured accordingly. By taking delivery of the equipment the hirer shall be deemed to have examined the equipment and to have found it in good order and condition and reasonably fit for its purpose. Should the goods be received damaged or in an un-satisfactory condition, notification to the Company must be made within 24 hours of delivery. Any loss or damage not notified within the stipulated time period will be paid for in full by the hirer. Damage includes but is not limited to the use of Pins/Staples or Blu-tac on Display Boards and Panel Systems and will result in the Hirer being charged for the replacement or repair of the boards as necessary. The hirer will fully and completely indemnify us against all actions, costs, claims and demands whatsoever brought or made against the Company, by any party arising out of the hire by us to the customer of any goods, materials, fittings and packaging save only where the same shall arise by reason of negligence on our part. In the event of hire equipment not being returned by the specified date, or not being available for collection on the pre-arranged date, the Company reserves the right to charge up to 50% of the total invoice value for each overdue day and recharge any re-collection costs imposed by our couriers. Should the hire be cancelled between 10 days and 48 hours before the hire commences, a cancellation fee of 10% will be charged, if cancelled 48 hours or less before the hire commences, a cancellation fee of 25% will be charged in addition to any costs incurred by the Company. No liability shall attach to the company for any delay in the delivery of the equipment due to unforeseen circumstances or causes beyond its control. All graphic production is subject to sight of artwork and approval of a final proof. We cannot guarantee matching previous graphic production due to material and technology changes. If you require sample products for assessment and evaluation purposes please contact our team. We charge for carriage and ask you to organise and pay for its return. The goods will only be charged for if they fail to return as agreed or return damaged. Colour swatches provided by the Company are for guidance only. Please note: Slight colour variations may occur from batch to batch. If you are a charity and are exempt from VAT, we will need proof of this in the form of a VAT certificate. If you do not hold one, or require further information on this, please speak to one of our sales advisors on 01793 613088. The customer shall comply with all regulations and conditions imposed by any exhibition organiser, promoter, hall owner or local or other authority and shall be responsible for obtaining their written consent to any modification thereto or waiver thereof as may be necessary to enable the Company to perform the service. All Exhibition stand drawings and designs, Web site design, text, graphics, the selection and arrangement thereof, and all software compilations, underlying source code, software (including applets) and all other material on this Web site are copyright of ACCESS DISPLAYS UK Ltd. and its affiliates, or their content and technology providers. ALL RIGHTS RESERVED. Model variation and design changes, price and availability information is subject to change without notice. All prices are shown excluding VAT (unless stated otherwise). Delivery timescales displayed on this website, on our literature and quotations are based on working days and are subject to stock availability as well as production schedules. The company does not accept liability for any errors or omissions in any, or all, of its publications and quotations nor on its website, and reserves the right to change information, specifications and descriptions without prior notice. 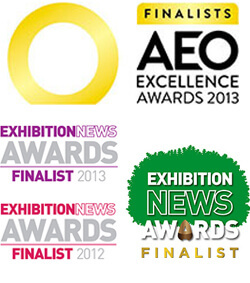 Thank you for choosing to shop with ACCESS DISPLAYS UK for all your exhibition needs.